Further Comments: During a month in 2014 it was reported that lighting was switched off and on again and, during one night, two bin lids were found spinning on the floor. The area was locked down as member of staff who spotted the lids feared an offender was loose, but CCTV footage showed the lids flying off the bins unaided. Further Comments: A prison officer reported hearing the sound of heavy rubber-soled boots while on his rounds, even though all staff were issued with sneakers. Believing his co-workers were playing a joke on him, he checked up on them, and found that they were playing cards. A couple of hours later, the officer heard a voice call out 'numbers C3', though once again could not find who was responsible. Asking his co-workers if they were responsible, they denied it, and recommended that the officer didn't say anything to anyone. Further Comments: A visitor who lay in a coffin for a photograph later realised that the captured image showed a strange face next to his. It is worth noting that the photograph is likely to be a case of pareidolia rather than the paranormal. The prison is also home to a phantom man seen walking down C Wing, and the sounds of both male and female voices. Further Comments: After spending a night at the jail, a ghost hunting group reported recording EVP containing a strange grunt. Members of the organisation also reported having stones thrown at them, even though they were alone. Further Comments: Castlerea Prison hit the news after it was claimed an exorcism was required after reports of strange paranormal activity occurring in the gym. Governor Dan Scannel dismissed the reports. Further Comments: Davies tended to the prison sheep between 1869 and 1929. He died soon after being released, but his ghost returned, walking the prison grounds on misty nights. The prison is also haunted by French PoWs from the Napoleonic wars, while some inmates believe jackdaws which fly around the area contain the souls of dead staff. Further Comments: Norman Quilliam reported hearing of several ghosts while he worked here including banging on the ceiling of a cell in which someone had committed suicide. Further Comments: A ground floor cell is said to be haunted by the scene of one prisoner murdering another with a table knife. Further Comments: A prisoner reported seeing a woman standing by a window in their cell. A guard later told them that someone had committed suicide in the spot the figure had stood. 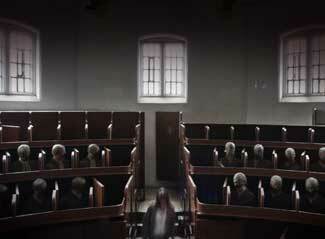 Further Comments: Newgate was haunted by several ghosts. Footsteps were reported along Dead Man's Walk late at night, one warden reported seeing the face of a decaying, hanged man in a cell, while others reported seeing an aging female form in the yard. Further Comments: While George MacKenzie has been blamed for the phantom attacks on sightseers at this locale, other people say it is the spirits of the prisoners. Either way, many visitors on the local 'ghost walks' have been pinched, pushed, pulled and even cut while at this spooky site. Further Comments: Both prison workers and villagers have reported seeing this phantom lady inspecting the prison grounds, and even driving her horse and carriage over a road close by where a bridge once stood. Further Comments: Two prisoners reported seeing a middle-aged man walking along the upper gallery, vanishing as he reached a cell door. After staff carried out a little research, they discovered the man was the last person to be executed in the prison. Further Comments: The area outside the surgery wing and the bricked up entrance to the old execution block are home to a phantom woman dressed in Victorian clothing, holding a lantern. Further Comments: This ghost is thought to be a woman who was held in the cells of the nearby abbey - she now appears in the jail and mocks the prisoners. Another story says she was killed by an inmate, and returns to continue her search for him. Activity is said to be particularly strong in cell 25 on the A3 landing. Further Comments: This building is said to hold both prisoners and several ghosts. A middle-aged woman with a young girl were reported moving around near a cell, while another prisoner again reported the young girl, but his time with a haggard old woman. Also, the grey form of a monk has been seen, reportedly once hanged here. An inmate experienced a shadowy figure which walked past him and mild poltergeist effects in 2008, while in 2010 another prisoner was awoken by their bed violently shaking and the sound of horses' hooves. Further Comments: This phantom manifests as a light that moves around the cells. 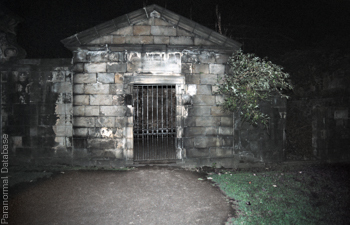 One former employee reported prison officers in Victorian uniform and the sounds of clanging chains, with the most paranormally active areas being the new wings which were constructed over executed prisoner's graves. Further Comments: This ghostly figure is thought to have dropped dead in the prison after seeing a relative in the nineteenth century. Further Comments: This pale woman is thought to have been a former prisoner who died during her stay. Witnesses have also reported the sounds of doors slamming and keys jangling in the area. One witness heard footsteps and the rustling of a dress - when they looked around, no one could be seen. Further Comments: Executed for murdering a policeman in the 1920s, Kennedy's shade remains in his former cell and continues to unnerve inmates. Further Comments: Her white robes flowing as she walks, the white lady is said to leapt from the battlements to escape punishment after being caught with a manservant. A young boy that also haunts the site is thought to be Richard Paterson who drowned in the Tay in 1939. Further Comments: This phantom man wearing a dark suit and carrying a briefcase has been reported by staff. If follows, he vanishes near the condemned cell. Some have named him as John Ellis, a former executioner who committed suicide in 1932. Further Comments: A prisoner who committed suicide in the jail reportedly returned to his cell after death, and was seen with his legs dangling over the edge of his former bunk. Newspapers reported that the shade caused other inmates to demand relocation to other cells. Another entity nicknamed the 'Beast of Parkhurst Prison' is rumoured to be half man and half bat and lurks on the rooftops, feeding off pigeons.